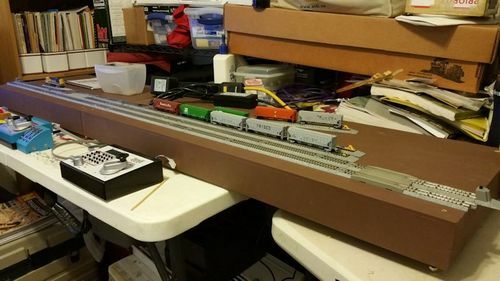 Description: My Inglenook Sidings switching layout on a Quint Set (Double & Triple). This is a classic 5-3-3 Inglenook set up for 50' cars and Atlas GP length locomotives. Any 50 foot cars can be used but I am using Micro-Trains 94000 series 3 Bay ACF Center Flow Covered Hoppers, Micro-Trains 96000 series PS-2 3 Bay Covered Hoppers, & TrainWorx PS2CD 4427 Covered Hoppers with an Atlas Santa Fe SD26 for the switcher. The module set will feature a small grain co-op with Butler/Sukup grain bins and a grain elevator. I plan to allow the public to switch on the module set at selected shows. Here is the track plan with the power drops marked. 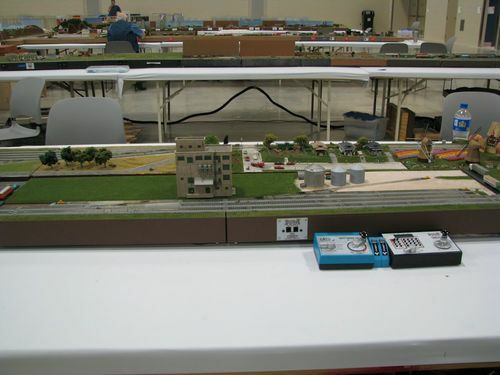 This is a photo of the module set with place holder buildings and scenery taken by Pam Deibert with SanTrak at the Worlds Greatest Hobby On Tour San Antonio show where it was part of the Worlds largest T-Trak Layout.